During the follicular phase (cycle day (CD) 1 to ovulation – generally about CD 14) estrogen is on the rise. So including a daily dose (1 Tablespoon each) of phytoestrogen rich flax seeds and zinc full pumpkin seeds can help to support this. It can also bind to excess estrogen and make it easier for our body to eliminate what it isn’t going to use. 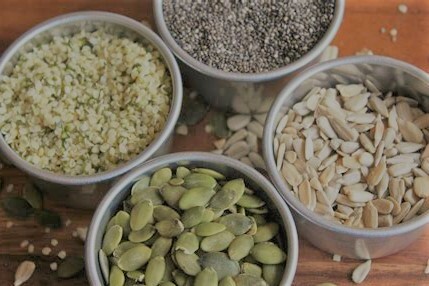 Once ovulation has passed and we enter into luteal phase (generally about CD 15 until menses – about CD 28) we switch to a daily dose (again 1 Tablespoon each) of sesame seeds and sunflower seeds. These seeds are rich in selenium and linoleic acid to support the increase of progesterone production and also help to balance out our hormones. It is best to grind your seeds fresh right before you are going to consume them. However, if you choose to grind a week or two worth of each and combine them, be sure to store them in a sealed bag in the refrigerator or freezer. I like to use a coffee grinder but, a good food processor, blender, or a mortar and pestle work as well. They can then be sprinkled in smoothies, soup, oatmeal, cereal, salad, anywhere that works well for you. In my opinion it is best to use raw and organic seeds if at all possible. Now you can keep notes of how you are feeling and any change in symptoms. This is also a great way to keep track if you did indeed consume your daily dose of seed shots. Worst case scenario: nothing really changes. Even if that is the case you can still rest assured that you have added nutrients into your routine. Best case scenario: it helps to balance hormones. Balanced hormones means a boost in fertility! Cheers to a wondrous journey of delicious seed cycling! You May Like How to make Exercising fun !